Precision Teaching has four guiding principles: (1) Focus on Directly Observable Behaviour, (2) Frequency as a Measure of Performance, (3) The Standard Celeration Chart, and (4) The Learner Knows Best (White, 2000). Focus on directly observable behaviour. PT focuses on directly observable behaviour that can be accurately counted and recorded (Neal, 1981). To define and operationalise what constitutes observable behaviour Lindsley (1991, 1997) devised the dead person’s test. If a dead person can exhibit the same behaviour then it is not a valid behaviour to count. Additionally, behaviour is not considered and counted in isolation but takes in the dimension of time spent behaving by counting specific movement cycles. Precision teachers must ensure that when defining behaviour that the behaviour is (1) observable and therefore countable, (2) you are counting movement itself, and not the absence of movement (e.g., sitting still or not swearing), and (3) ensuring that it is a movement that you are counting rather than a label (Alper & White, 1971; White, 1986, 2000). Frequency as a measure of performance. Lindsley discovered through his research that frequency was between 10 to 100 times more sensitive to detect changes in patterns of behaviour than percent correct (Lindsley, 1995). Traditional measures of academic performance are usually taken using percent correct as the measure, but this measure does not inform sufficiently about performance change, because it leaves out the most important information—that of time taken to complete the activity (Eshleman, 1992; Lindsley, 1995). Additionally it ignores the fact that corrects and errors can differ in frequency independently from each other, and as such are not mutually exclusive (Binder, 1996, 2001). Within a PT framework frequency of correct and incorrect scores in academic tasks can provide additional information that affords insight into each pupil’s proficiency at a particular subject and goes beyond what can be discerned from percentage correct data (Kubina & Morrison, 2000). Figure showing a likeness of the daily Standard Celeration Chart. Learner knows best. This is one of the most important of the guiding principles, as it emphasises that the learner is at the centre of the learning process. And that the learner’s data when viewed on the SCC will guide the teacher in making effective decisions for that individual in a timely manner (Lindsley, 1972, 1995). “Essentially, in order to be responsive to the pupil’s needs the teacher must be a student of the pupil’s behavior, carefully analyzing how that behavior changes from day to day and adjusting the instructional plan as necessary to facilitate continued learning. Precision Teaching offers a set of procedures designed to assist in that process” (p. 1). The Four Guiding Principles of PT by Dr Mike Beverley is licensed under a Creative Commons Attribution-NonCommercial-ShareAlike 4.0 International License. Alper, T., & White, O. R. (1971). Precision teaching: A tool for the school psychologist and teacher. Journal of School Psychology, 9(4), 445-454. Binder, C. (1996). Behavioral fluency: Evolution of a new paradigm. The Behavior Analyst, 19(2), 163-197. Calkin, A. B. (2003). Some comments on precision teaching. European Journal of Behavior Analysis, 4(1 & 2), 1-4. Calkin, A. B. (2005). 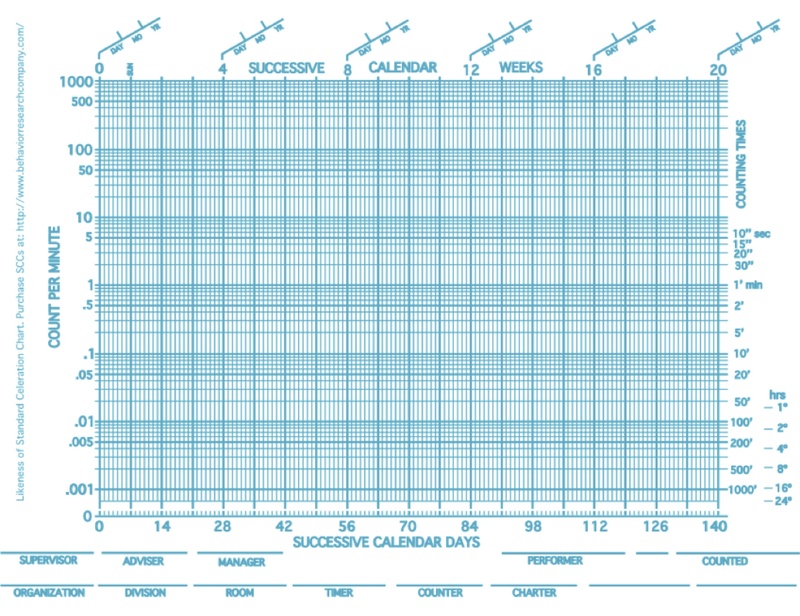 Precision teaching: The standard celeration chart. The Behavior Analyst Today, 6(4), 207-213. Eshleman, J. W. (1992). A behavioral measurement parable. Journal of Precision Teaching and Celeration, 9(1), 6-19. Graf, S., & Lindsley, O. R. (2002). Standard Celeration Charting. Poland, Ohio: Graf Implements. Kubina, R. M., & Morrison, R. S. (2000). Fluency in education. Behavior and Social Issues, 10, 83-99. Lindsley, O. R. (1972). From Skinner to precision teaching: The child knows best. In J. B. Jordan & L. S. Robbins (Eds. ), Let’s try doing something else kind of thing (pp. 1-11). Arlington, VA: The Council for Exceptional Children. Lindsley, O. R. (1991). From technical jargon to plain English for application. Journal of Applied Behavior Analysis, 24, 449-458. Lindsley, O. R. (1995). Precision teaching: By teachers for children. Journal of Precision Teaching, 12(2), 9-17. Lindsley, O. R. (1997). Performance is easy to monitor and hard to measure. In R. Kaufman, S. Thiagarajan & P. MacGillis (Eds. ), The guidebook for performance improvement: Working with individuals and organizations (pp. 519-559). San Francisco, CA: Jossey Bass. Pennypacker, H. S., Gutierrez Jr., A., & Lindsley, O. R. (2003). Handbook of the Standard Celeration Chart: Deluxe edition. Concord, MA: Cambridge Center for the Behavioral Sciences.